Don’t Go Breakin’ My Heart! 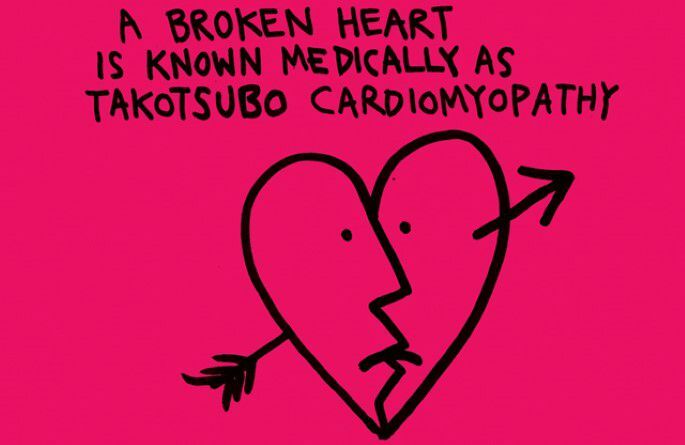 Broken heart syndrome is an actual medical condition – takotsubo cardiomyopathy. It was first diagnosed in Japan and takotsubo is the Japanese word for octopus trap, which is the configuration the heart takes when broken heart syndrome strikes. Until more studies are done we won’t know the exact cause of broken heart syndrome, although a surge of stress hormones – such as adrenaline – is commonly thought to be an underlying cause. Broken heart syndrome seems to affect women more than men – in particular, women over the age of 50 – but more research is need to confirm that as well. The condition is often called broken heart syndrome because it’s typically brought on by a very stressful situation, such as a difficult break-up or death of a loved one. The condition mimics an actual heart attack, and can easily be mistaken for one. Patients experience all the symptoms – sudden chest pain, shortness of breath, weakened heart muscles, and a temporary disruption of the heart’s normal pumping action. A condition that usually reverses itself in a matter of weeks, takotsubo cardiomyopathy is generally treated with the same medications as an actual heart attack, with psychotherapy usually recommended as well to help alleviate stress. While less dangerous than a heart attack, broken heart syndrome can be life-threatening for some patients because it may involve severe weakening of the heart muscles. To date, researchers have been unable to identify specific risk factors that lead to broken heart syndrome, so my prescription is a preventive one: eat smart, exercise regularly, and eliminate as much stress from your life as possible in order to maintain an overall healthy body and mind. If you experience any chest pain – especially long-lasting or persistent pain – shortness of breath or a rapid, irregular heartbeat, don’t assume it might be broken heart. Call 911 right away. If it is takotsubo cardiomyopathy, have it treated…then get back to following a routine of healthy eating, exercise and regular check-ups with your cardiologist.